The WonderGliss coating that is baked into the ceramic doesn‘t give grime a chance: dirt and limescale cannot secure a hold on the smooth surface, so residue runs off more easily with the water. 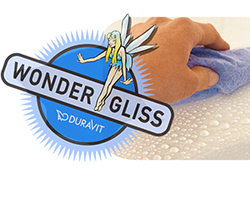 Sanitary ceramics featuring WonderGliss stay smooth and clean for longer and are thus extremely easy to clean. All it takes is soft cloth and mild cleaning agent. The Starck 3 Floor Standing Bidet from Duravit has got an appealing modern look. This Floor Standing Bidet is designed by Philippe Starck and features smooth, efficient appearance and carries spectacular modern style. This lovely bidet is constructed in sanitary white ceramic with glossy white finish to give this bidet a reliable look. It comprises a single tap hole and comes complete with an overflow and fixings. W 14 5/8" x D 22" x H 16 7/8"